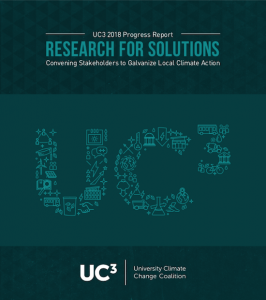 As leading research institutions, UC3 members are committed to leveraging their institutional strengths to foster a robust exchange of best practices and lessons learned in pursuit of accelerating local climate solutions that reduce greenhouse emissions and build community resilience. The University Climate Change Coalition, or UC3, is a bold new coalition of leading North American research universities that will prototype a collaborative model designed to help local communities achieve their climate goals and accelerate the transition to a low-carbon future. In launching UC3, distinguished universities from the United States, Canada and Mexico have committed to mobilize their resources and expertise to accelerate local and regional climate action in partnership with businesses, cities and states, foundations, and other organizations. UC3 operates in close partnership with Second Nature’s Climate Leadership Network, a group of hundreds of colleges and universities that have committed to taking action on climate. Convening Stakeholders to Galvanize Local Climate Action, UC3's progress 6 months after the launch in Tempe, AZ. UC3 welcomes Queen's University in Kingston, Ontario to the Coalition!